Lee Mingwei’s projects belong to the spheres of perception and suggestion. They have no connection to the commercial art market per se. They are commissioned by major museums and institutions. The Taiwanese-born and New York based artist is interested in the moment that captures a relationship between himself, people and places. His performances and installations subtly bring us into a world of self-awareness via routine activities--« we eat, » « we sleep, » « we write, » « we offer a gift »-- all actions that we no longer notice, because they are so banal. And it is the banality that is at stake here. It is the starting point for an exploration of relationships, which is anything but banal. « I think that one of the most exciting things about contemporary art is that we are trying to do something that is out of the ordinary, » said the artist in an interview given to Asian Art News in December 2008. 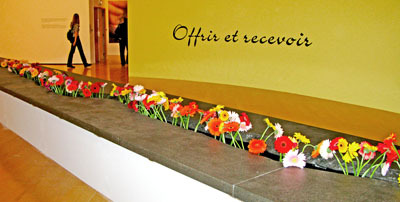 Lee Mingwei’s search to use the ordinary to go beyond the ordinary preceded the 10th Biennale of Lyon (2009), which was based on the theme of « Reinventing the Ordinary. » The idea was to have ordinary people become participants and evolve on the same plane as the artist. (See our article « Reinventing the Ordinary » in the section PointerAtWork of www.thepointeradventure.com ). 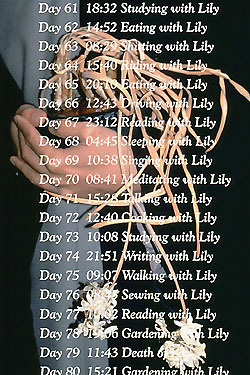 100 Days with Lily is a very intimate and physical project that has great personal meaning for the artist. It was undertaken and carried on in the memory of his grandmother who passed away in Taiwan while he was in California. She was the first woman from Taiwan to study western medicine in Japan, and she opened her own clinic when she returned home in the 1930s. Lee Mingwei was deeply affected by her death and he felt that he needed to spend some time with her, and the memory of her, in order to accept death as a passage. He planted the bulb of a lily, and he followed the steps of its growth, blossoming, wilting and death. The artist lived with the plant and carried it for 100 days. Each change in the state of the plant was carefully noted on the day and hour that it took place. A photograph shows Lee Mingwei’s hands holding a pot with the plant whose flowers have just faded after the natural cycle was completed. 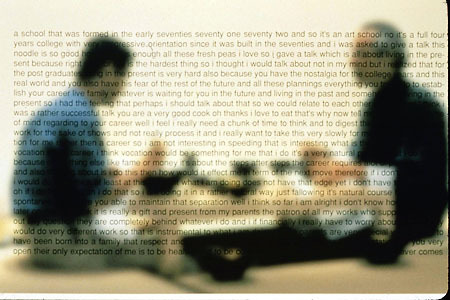 The image serves as part of a diary. We can follow the artist’s daily involvement with the plant. Day 61 – 18 :32 Studying with Lily. Day 75 – 09 :07 Walking with Lily. Day 79 – 11 :43 Death. But life continues in the heart and in the memory. We have to let it go, but not necessarily at the exact moment of disappearance. At that time, Lee Mingwei was working as a weaver in a textile factory in California. Every day, he would carry the plant with him in the bus. People in the bus, mainly Hispanic, started to talk with him, because he looked like a spiritual man with his short hair and long robe. Older women started confessional conversations with him. The project, although intimate in its conceptualization, took on a public face with the spontaneous participation of people. 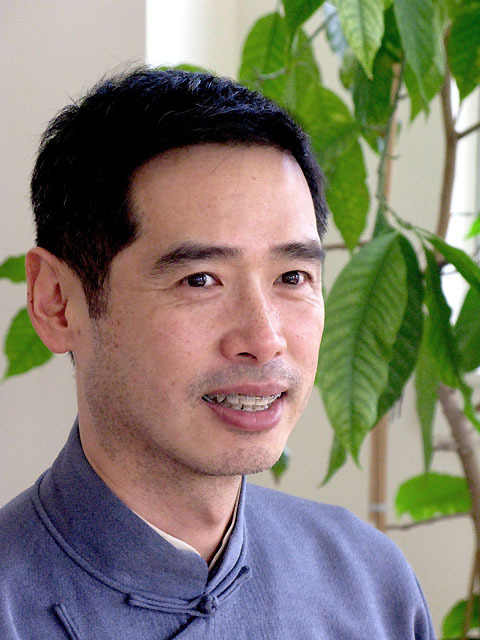 When Lee Mingwei went to the Chinese mainland for the first time, he felt the scars of people and the destruction of the richness of China’s traditional culture deeply. Taiwanese have remained Confucians. The Cultural Revolution tried to destroy Confucianism. When looking at Lee Mingwei’s installations, one is filled with wonder. The precision in the orchestration and the elegance in the design echo his studies of biology and architecture, two disciplines that require method. From the BA in Textile Arts and the MFA in sculpture, he absorbed the sensibility for materials and the projection of ideas and forms onto the public sphere. Coming from the West Coast, the young man felt isolated when he arrived at Yale University in 1995 for his graduate studies. He elaborated the Dining Project, a one-on-one project focusing on themes such as intimacy, trust, anonymity and self-awareness. The project started as a projection of an old Taiwanese custom in which newcomers in a village or in a small town go to the soy milk breakfast place (doujian dian). Hospitality requires that the newcomer be invited into homes and eventually to meet the whole village. Based on the idea of « meeting the whole village, » Lee Mingwei thought of doing something similar in New Haven. He posted hundreds of posters around the campus asking people interested in an introspective conversation and food sharing to contact him. The first day, 45 people showed interest! For a whole year, Lee Mingwei cooked three to four nights a week. The « rules » were that the meal would be prepared according to the individual’s dietary preference and that the participant would be highly encouraged to converse freely during the meal. The meal would be served to a single person and there would not be any conversation during the dinner. The acquaintance with the stranger was to be accomplished before the actual meal. The Dining Project operates at two levels. There is the elaboration of a relationship with a complete stranger. Then the food acts as a medium for mutual trust and intimacy. In 1998, the Whitney Museum commissioned the show with a few variations. This was the beginning of Lee Mingwei’s entry into the world of museums and institutions. The Whitney Museum created a lottery making the selection of participants unpredictable. 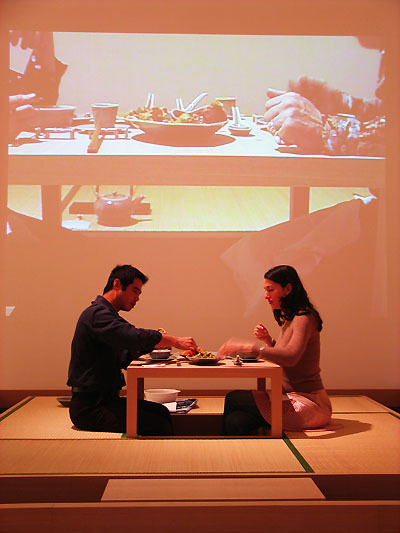 The installation per se was very simple: a tatami and a low table. The whole process was recorded on video, with the camera lens at the level of the food. The anonymity was preserved. The video was projected the next day on the wall behind the tatami installation. Bits of the conversation were audible. Pieces of the action of eating and sharing food and conversation were visible. The project became then part of a museum, a public space, where visitors could explore change through interaction. The Dining Project at the Whitney Museum of American Art, New York. 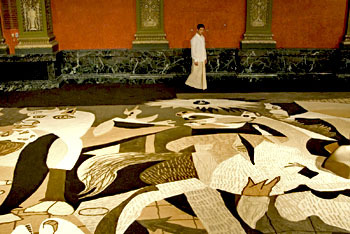 Gernika in Sand at Queensland Gallery of Modern Art, Brisbane, Australia. The choice of sand as the primary material recalls the sand mandalas created by Tibetan Buddhist monks. Mandalas are reflective pieces on the ephemeral nature of material life. Sand, a ‘powder’ created from the erosion of rocks by wind and water, will again become rock one day. When one thing changes, other things can come from it. 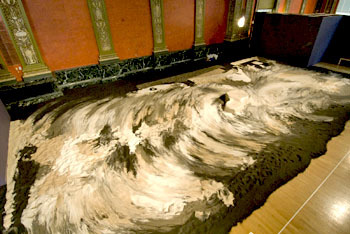 Lee Mingwei used 40 tons of sand to create a 50-foot long by 30-foot deep reproduction of Picasso’s painting. But here, we go beyond the idea of a reproduction. Gernika in Sand took on its own life by becoming a performance articulated around four phases. 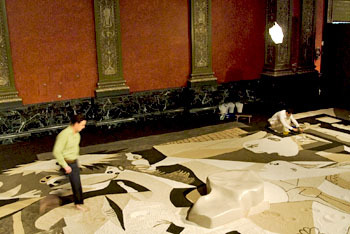 The first phase was to have a nearly completed sand-version before the exhibition opened. One small fragment of the composition was missing because the artist wanted to show that it was a performance in phases. The composition was left untouched for weeks so people could come, see it and absorb it in this undisturbed phase. On the Monday of the 7th week, at sunrise, the artist completed the piece using the whole day. It was the signal that people could begin walking barefoot on the sand, one person at a time while he, the artist, simultaneously finished the piece. The alteration became a ceremony, which would be internalized differently by each individual. It was a dynamic between two people who efface and create. An artificial island placed on the composition allowed visitors to take a step back, and to physically see and emotionally live the process of destruction and creation. 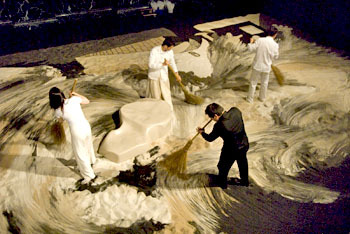 At sunset, the artist invited 3 visitors to brush the sand with him toward the middle of the disturbed composition. That would be the stage at which people would see Lee Mingwei’s work for the next 6 weeks. Only a small fragment of the original composition was left untouched for people to identify Picasso’ s artwork. Impermanence and destruction-creation effect purification. What is important in Gernika in Sand is that perception is very different from one person to another one. The artist himself experienced changes throughout the whole process. « For me, the enlightening experience was to look at it at the beginning, being involved in the creation of something beautiful and then, at the end, to realize that it was completely destroyed. Interestingly enough, a lady came almost every single day because she realized it would be destroyed. She became very agitated when the day became closer and closer. She was one of the last people to walk on this piece before the sun set. Then she watched me brushing up. She came to me and she was in tears. She said to me that before that stage it was for her about death. She said that at that stage the death mask had been lifted. Life comes out. It took me a few seconds to realize that she understood my work though me, the creator, did not understand it. » Beauty comes from healing and is a way to respond to victimization. Australia. Courtesy of the artist and Queensland Gallery of Modern Art, Brisbane, Australia, 2008-present. 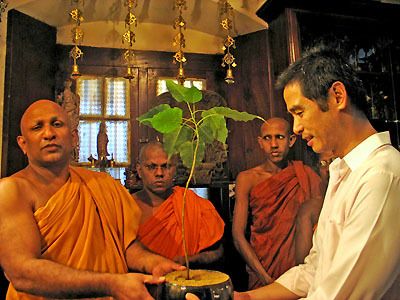 Bodhi Tree Project for Queensland Gallery of Modern Art, Brisbane,Australia. 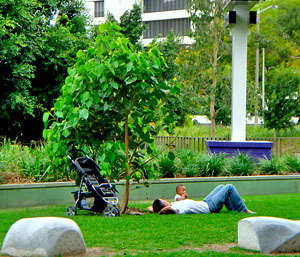 Courtesy of the artist and Queensland Gallery of Modern Art, Brisbane, Australia, 2008-present. Reaching the innermost depths of oneself is the core of Lee Mingwei’s conceptual projects. He facilitates the exploration of our « I » by placing us in a conversational environment with other human beings. Situations do not have to be fixed in advance. They develop slowly around a very simple action that forces us to reflect on the « we » that we are establishing if we take the time and if we make the effort. From the time Lee Mingwei graduated from Yale University, he kept a very personal relationship with one gallery based in New York’s Chelsea district. The Lombard-Freid Projects understands the artist’s commitment to museums, institutions, biennales and triennials around the world. 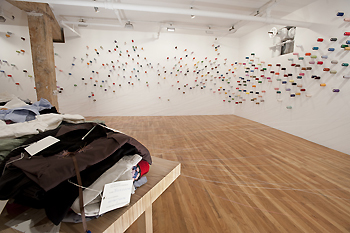 The Mending Project, 2009, is also based on a simple idea that developed in the gallery as a performance. The installation was minimalist: 450 bobbins of thread, neatly placed on two panels, a table, two chairs and a small sewing kit. People were invited to come to the gallery and bring something to repair. The conversation started when people chose the color of the thread, sat down and looked at the mending process. « I celebrate the rip, » says Lee Mingwei. « I try not to hide it. Then, when it is repaired, the thread is still attached to the garment. A pile is building up and there are more threads pulling from the wall. It is like a lot of my projects: it is cumulative. » The process started when the show opened, not the other way around as usually happens in a commercial gallery. The project here takes its full social dimension as the conversation between the artist and the participant takes place while the artist repairs the garment. In the end, it is about the objective of work. How do we integrate our actions into our lives, how do we share this with others. Ultimately, Lee Mingwei creates a place to go, to develop an intimate story, which he then entrusts to us so we can explore it and share it with others.